It’s been a while. I’m going to chalk it up to my new, non-music radio show that I started, Green Grid Radio. It has occupied a lot of my free time of late. 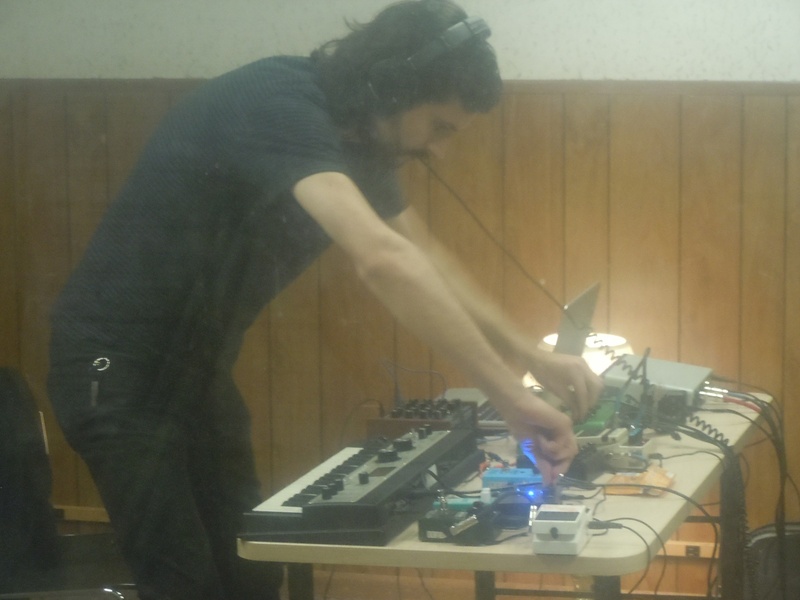 I decided to post some photos from a recent live performance on KZSU. We were lucky to have Evan Caminiti (of Barn Owl, Higuma, and his own fame) and Vestals (aka Lisa McGee, also of Higuma) perform on Wednesday Night Live. As is the case with everyone else I meet in the bay area music scene, Evan and Lisa were great folks to chat with. Oh yeah, they also play the most beautiful music. 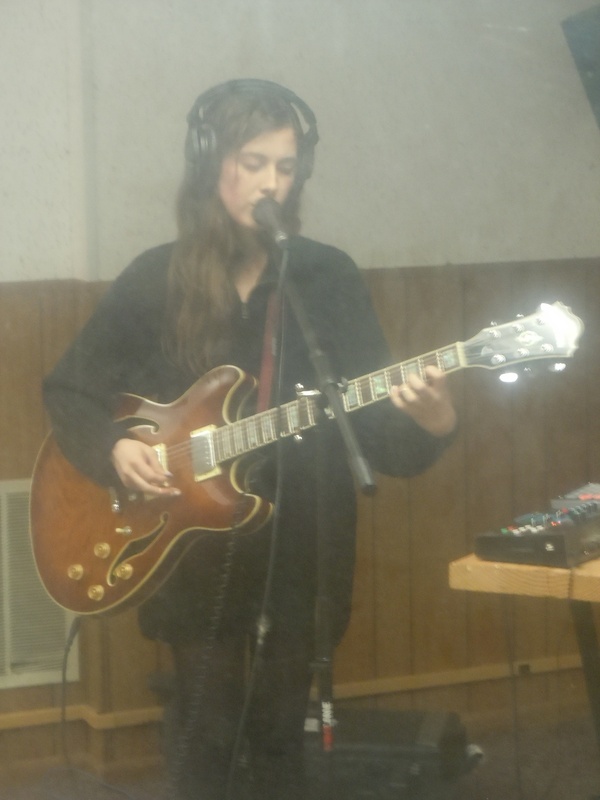 Lisa McGee’s music is as ghostly and dreamy as the apparent effect on this photograph, thanks to the old studio windows at KZSU. Her album Forever Falling Toward the Sky was released on local legendary label Root Strata and received a lot of attention here at KZSU over the summer. Though seeing her perform this in person was a whole new thing. Just warm blankets of bliss. Caminiti, fresh off the release of 2012’s guitar-driven Dreamless Sleep, followed Vestals on a whole new setup. 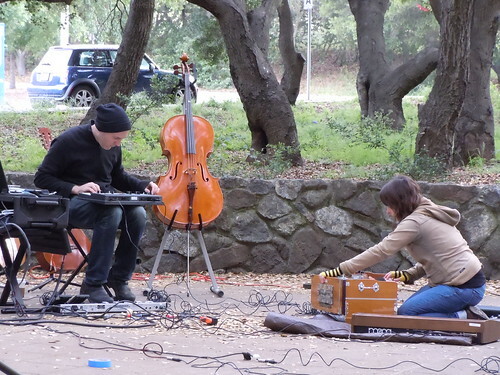 Lisa told me that he planned to utilize a brand new modular synthesizer in the performance, but troubles in the mail prevented this, and Caminiti shifted his set to incorporate this setup of pedals, effects, laptop, and keys. It was cool stuff. Brand new, dark, dreary, and beautiful. We’re really fortunate to have hosted. Again, college radio has the honor to unleash the best new music to listeners. That’s it for self-promotional time for now. Have a nice rest of your month of November! Most of you probably have arrived at my blog to download an interview with a musician or label head. The blog was originally the self-indulgent toilet for me to post shameless advertisements for my lame radio show on KZSU. Anyway, I’ve come full circle at this point. No exciting interviews to report, simply an overdue mention that longtime DJ partner Luke and I have returned to Lost Verses on Thursday evenings/Friday mornings 12-3am PST. You can tune in at http://kzsulive.stanford.edu to hear the program live in its full glory. The only other thing I’ll say is that I’m excited about seeing White Hills in a couple of weeks. Their new album, Frying On This Rock is heavy, stoney, and psychy in the best possible ways. Last time they were on the touring circuit in California, I missed them, having just arrived back from Europe in a daze and frenzy. Go out there and support artists by going to shows, buying merch, and spreading the good word.